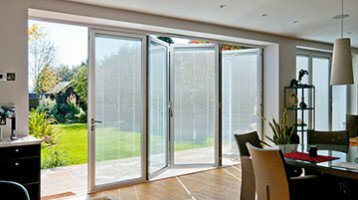 Cheam Windows are expert installers of BiFold Doors and know there are a number of key issues to consider when choosing the right Bi-folding Glass Door. Not only do Cheam Windows use glass of the highest quality and construction but your bi-folding doors are available and standard double glazed doors and even with the latest generation triple glazing. Better home security is a built in feature of all of our Doors and Windows including bi-folding doors. All our bi-folding glass doors come as standard with toughened glass. Toughened glass in itself is very hard to break and toughened glass will meet all the current British Standards. Laminated glass is also an option should you wish to have extra security. Very much like a car windscreen laminated glass is hard to break but when broken it holds together. A door is only as good as the lock. Cheam Windows Bifold Doors come with an eight point multi-point locking systems and Kite marked Magnum Security Cylinders that are proven to resist snapping, picking, drilling and bumping – just some of the methods used by thieves. This will provide a high level of security and still keep style. And with all this very good security, the doors remain slim, strong and secure. Visit our showrooms in Worcester Park, Hampton Court and Banstead High Street and let us show you other special features of our Bifold Doors such as as ‘finger safe’ gaskets between individual door leaves which provide safe cushioning to avoid a child’s or adult’s fingers being trapped. We will also show you the free glide running gear, the top quality hardware available and a wide variety of colour options. Cheam Windows bifolding doors are different. It is a given today that home improvement products will come with a guarantee. 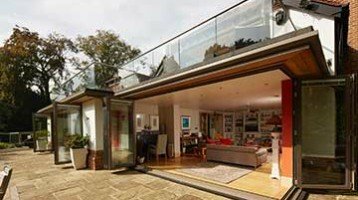 However our Guarantee on bifolding doors is unique at 20 years. You don’t have to have white. Cheam Windows offer a big variety of colours not just on bifolding doors but on all our aluminium window and doors. Whether you need bring pastels, primary shades, deep tones or even wood effects we can provide a product to suit. 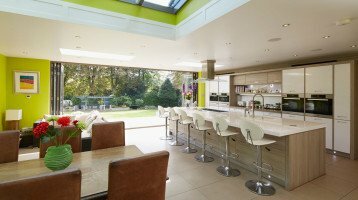 Today modern homes often come in more than one colour, and our Bi-folding doors available in different colours inside and out. Your doors can match the outside and inside equally. Cheam Windows bi-folding doors start as a single swing door right up to large eight door assemblies. We can even offer fully opening corner sets of doors that allow the whole corner of a home to be opened up offering unrestricted vision and maximizing access in and out of the property. Why not add to your brand new doors with a range of custom electric blinds that will add the perfect finishing touch. 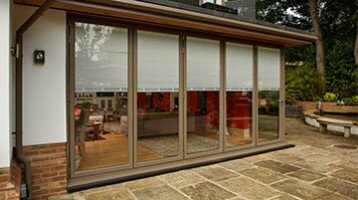 Available in a wide selection of colours they provide shade from the sun and privacy at night, as well as that popular designer look.